The score’s initial passing resemblance to Bepler’s Cremaster score, heavy on atonal art standards, quickly dissolves into deconstructed pastiche, a fun free jazz lobby music suspending, like the film’s forever-digressed plot, a never-coalescing, and distending like cremaster muscle the foreboding long shots of architecture’s banal non-ness, opposing Barney’s continual erection - square shots on male architecture - with your more standard on-the-fly montage cuts of hollywood banality, Hartt’s sometimes fun Tacita Dean style ride. The home of Ebony/Jet comes off as far more interesting merry-go-round than Dean’s even most alluring Kubrickian evirons. 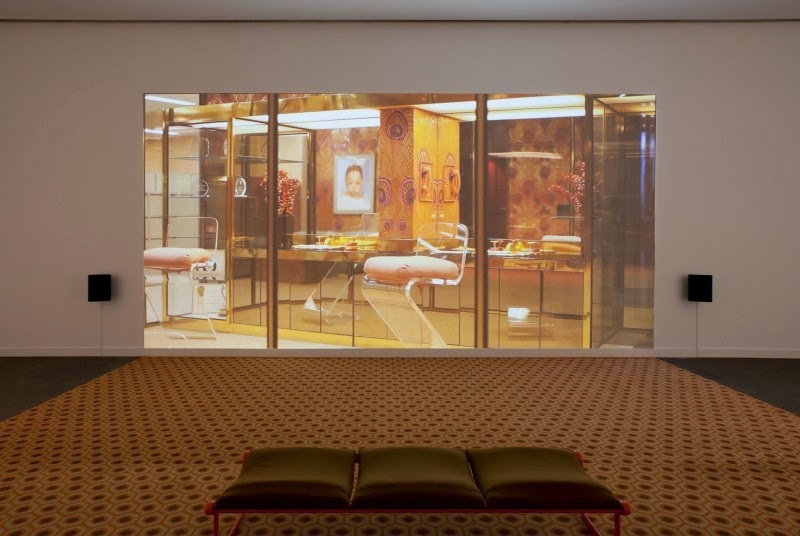 The exhibition's documentation mirrors the film’s fetish of architecture.